"Who is the murderer? What does he look like? Where is he hiding?" Not all the great silent film directors made a seamless transition to sound, and even among those who did, some had to be dragged kicking and screaming into the world of cinema engendered by The Jazz Singer. Fritz Lang was among those who came along grumbling into the world of talking pictures, which makes it even more astonishing that M was his first movie in the new era, because it's got the aesthetic control and fire in the belly of a master, and hence it's not too much to call it a masterpiece. It also proved to be an astonishingly influential movie, but the better than seventy years, and countless imitators, haven't blunted any of the film's power; this is one of the necessary documents of Expressionism, certainly, but it's no mere museum piece, and it still plays with a tautness and drive practically unrivaled on screen since its release in 1931. Somebody has done away with little Elsie Beckmann, and that somebody is played by Peter Lorre, in a transfixing performance. He's got the sweaty, paranoiac countenance of a child molester, and once you see this movie, it's hard not to see that aspect lurking under all his other performances. The town, rightly, is in an uproar, over all the disappearing children, and the seeming impotence of the authorities to do anything about it. The police, then, are on a vengeful manhunt to track down the killer; as the headlines shriek, nobody is able to do or think or talk about anything else, which, as the forces of organized crime discover to their chagrin, is bad for business. They, too, vow to get some rough justice on the child killer, and Lorre is pursued by those with a tremendous amount at stake, be it the long arm of the law or the almost rabid vigilantism of the mob. The beggars who populate the city are pressed into service, as an informal but highly effective espionage organization�if anybody on the streets does something even marginally inappropriate that involves a child, all eyes will be on them. And so the manhunt is on, with the forces of crime and the law united in pursuit of a common enemy; in that aura of paranoia, everyone, even a parent accompanying a child to school, is a suspect. Image Transfer Review: Lang shot in the unusual 1.19:1 aspect ratio�more space on the film was devoted to the soundtrack�and that's preserved here, with pillarboxing, or black bars on either side of your screen. (If you've got a widescreen TV, the bars will be that much wider.) There are occasional resolution problems, and still a few instances of scratching, but overall this is a stellar effort; M has looked muddy and unpleasant in past home video releases, and this one clearly improves upon the previous Criterion release of the same title. You could cut yourself on the sharpness of some of the shadows�a stellar effort. Audio Transfer Review: It sounds like just what it is: a very early sound picture, with a good amount of hiss and crackle. As with the image quality, Criterion has done yeomen work in showing the audio track off to best advantage; but with talking pictures in their infancy, the recording on M necessarily bears the mark of its time. Pop on over to the second disc for more meaty information. In 1975, William Friedkin got the director to sit for a Conversation with Fritz Lang (49m:26s), and this is the onscreen Lang of Contempt, the irascible, grand old man of cinema. The free-ranging conversation provides an excellent career and biographical overview, with an emphasis on his life and work in the 1930s. In 1982, French television commissioned directors to pay tribute to their favorite films, and Claude Chabrol wisely chose M�his M le maudit (10m:43s) respectfully retells the story of Lang's picture in ten minutes. In an accompanying interview (06m:47s), Chabrol discusses the significant influence of Lang on his own work. An August 2004 interview (14m:30s) with Harold Nebenzal, whose father, Seymour, produced M, is a discussion of the family's history in the film business, and a reminiscence on Harold's visits to the set as a child; he remembers Lang as "an autocratic director in the true German sense." The film's editor, Paul Falkenberg, taught at the New School (where your humble reviewer currently teaches), and what's here is sort of a primitive commentary track: recorded in 1976 and 1977, it's a good chunk of the movie (36m:08s) projected for Falkenberg's students, with the editor providing insight into the production history and his work with Lang. He stops and starts the film to chat about it and field questions; aside from offering solid information about M, it's a reminder of the difficulties of teaching film studies in the pre-video age. A Physical History of M (25m:08s) is riveting stuff for film geeks like me; it describes the unusual aspect ratio, and spends a good amount of time on the various running times of the film. (Censors and editors account for the fact that there have been at least four authorized cuts of the movie; some of the scenes deleted from the original release in 1931 have unfortunately been lost forever.) In the early days of talkies, the notion of dubbing hadn't taken hold; we see reshoots for the initial release in France, with Lorre reprising his climactic speech in French this time instead of German. Unsurprisingly, the film was deemed decadent by the Third Reich, which even included a clip of it in an anti-Semitic propaganda film, reproduced here; the movie was later unwisely remade in Hollywood, with David Wayne in for Lorre. A gallery of stills has four chapters' worth of images from the film, and a fifth of posters and documents, including a reproduction of the program from its German premiere. The good stuff continues in the accompanying booklet, too, with an essay on the film by The New Republic's Stanley Kauffmann; script pages from a lost, censored scene; three pieces of journalism contemporary to the film's release, one of which is by Lang; and the transcript of a 1963 interview with the director conducted by film historian Gero Gandert. A final word of praise, too, to the menacing menu designs, which aptly capture the spirit of the piece. 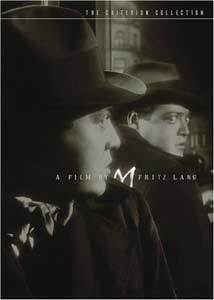 Everyone from Hitchcock to Fassbinder and beyond owes a huge debt to Fritz Lang, and M remains a jolting, gripping bit of storytelling. It looks razor sharp here, and comes with a paradigmatic package of extras. A typically stellar effort by Criterion on one of the great films makes this one easy to recommend.